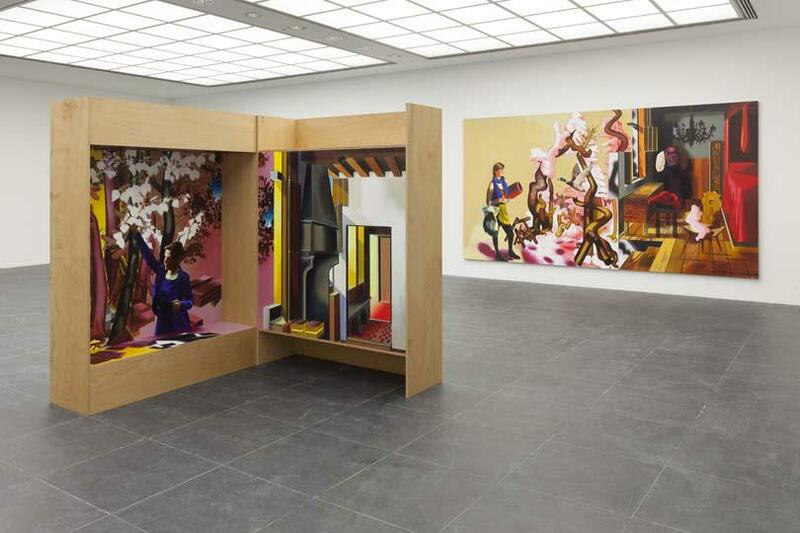 In 2003, Frankfurter Kunstverein presented the work of fifty young German painters in the exhibition ‘Deutschemalereizweitausenddrei.’ The show aimed to represent a generation’s new optimism for a traditional medium, as well as the varied influences the works invoked. In the accompanying press release a move ‘back to painting’ in Germany was referenced, alongside the medium’s ongoing social concerns - its capacity for political subversion and ‘historical potential for critique and reflection.’ What this show recognised was that painting lived brightest when powered by multiple influences and concerns - which ultimately fuels good art. It also recognised that the market and the work could no longer be untethered - some of the most powerful and political German paintings have achieved in both the market and the mind. We need only think of Anselm Kiefer’s ‘Sulamith’ (1983) or Gerhard Richter’s ‘October 18, 1977’ series (1988) to understand the sort of social and fiscal fusion paintings with an emotional core can achieve. 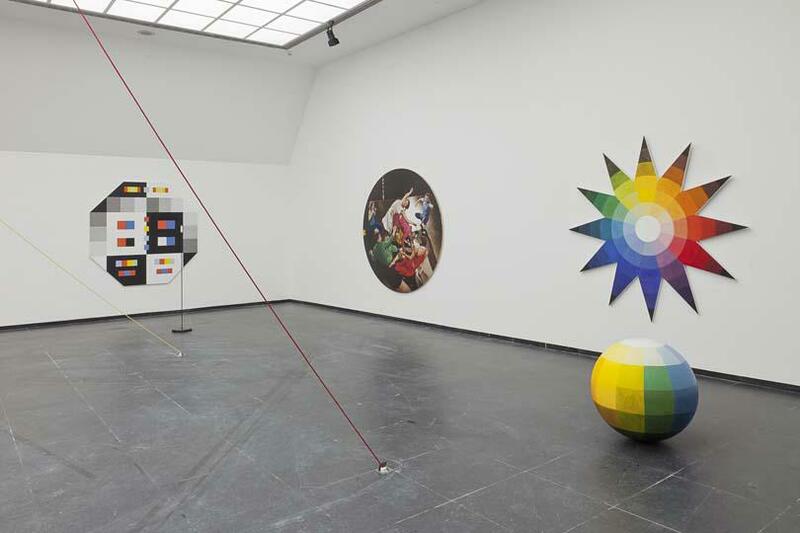 Some sixty artists or so exhibited in ‘Deutschemalereizweitausenddrei,’ with big names of today like Katharina Grosse and Corinne Wasmuht, hiding in the ranks at the time. 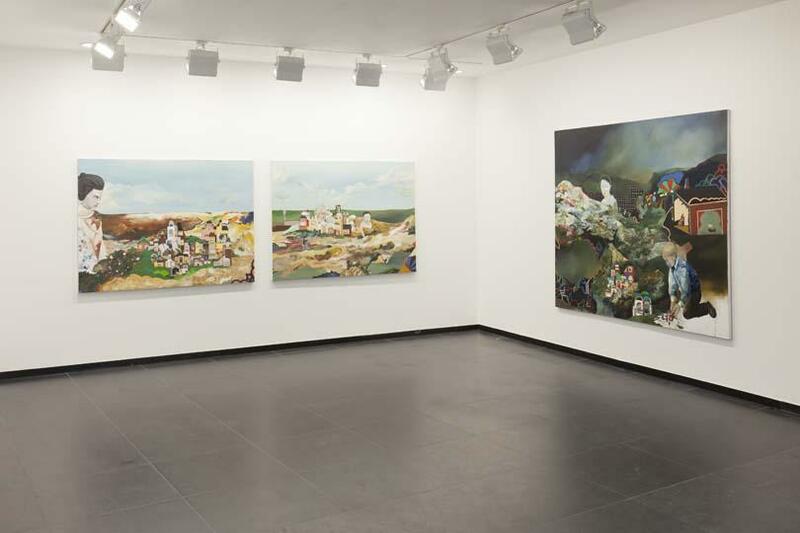 Flash forward almost ten years, and the Frankfurter Kuntsverein is staging another survey exhibition focusing on contemporary painting. Beyond this premise, ‘Malerei Der Ungewissen Gegenden’ (‘Painting of Uncertain Places’) 2012 shares little in common. Only four artists are shown - Tilo Baumgärtel, Susanne Kühn, Antje Majewski and Hannes Michanek - and each present figurative paintings that depict moody, isolated and despondent worlds. The opening works depict a vacuum of blue sky and pastoral landscapes by Frankfurt-based Hannes Michanek. 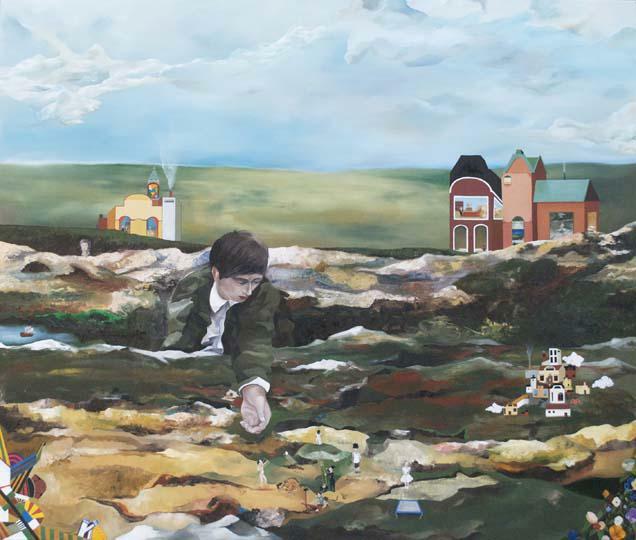 In ‘Fleshclouds (The discovery of indistinct enlargements and obviousness of things)’ (2008), we see a suited boy or young man, squatting in the crevasse of a toy-like countryside. Dwarfed by the immense presence of the figure, houses puff smoke from small chimneys; in the windows scenes play out discordant to outside. In the foreground, minute people stand apart indifferently. In ‘Warm milk (foam ghosts)’ (2011) Michanek succeeds more by widening the scale and complicating his composition - dark skies, and the orb of a full moon breaking through parted storm clouds, help to push the mood to a spookier level. Leipzig-based and Arno Rink-taught Tilo Baumgärtel presents a mixture of large canvases, as well as charcoal, pastel and ink drawings. 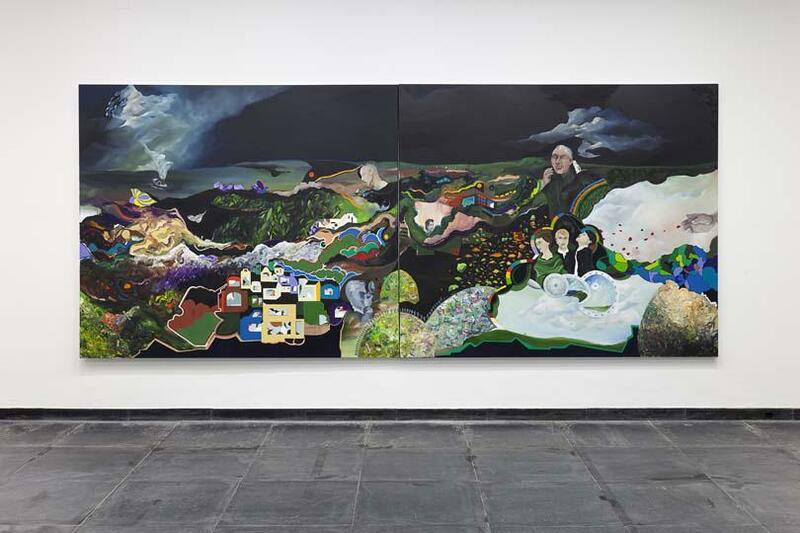 ‘Der Sturm’ (2008) takes pride of place and is a nice example of Baumgärtel’s talent for creating dark and complex works. We look outwards from the husk of a modernist pavilion - paint peels from raw concrete walls, light from a single bulb illuminates dry grasses and strewn rubbish on the floor. In the corner two figures huddle together, one with a lit cigar pressed to his mouth. At the edge of the room a hooded figure sits with a dog, looking outwards as bolts of lightning strike the horizon. We witness a scene of urban collapse; disorder seems to rule. Small scenes play out across the picture, but never appear interrelated or dependent. This incoherence unsettles the viewer, destabilising any clear narratives and generating a sense of the uncanny. In ‘Die Nachtwache’ (2011) a naked, red-glowing figure perches on top of a tree stump with a conquistador helmet on his head. At his feet, two naked figures appear to either fight or fornicate. Stray animals lurk at the edge of the light, circling the central scene with lit eyes. 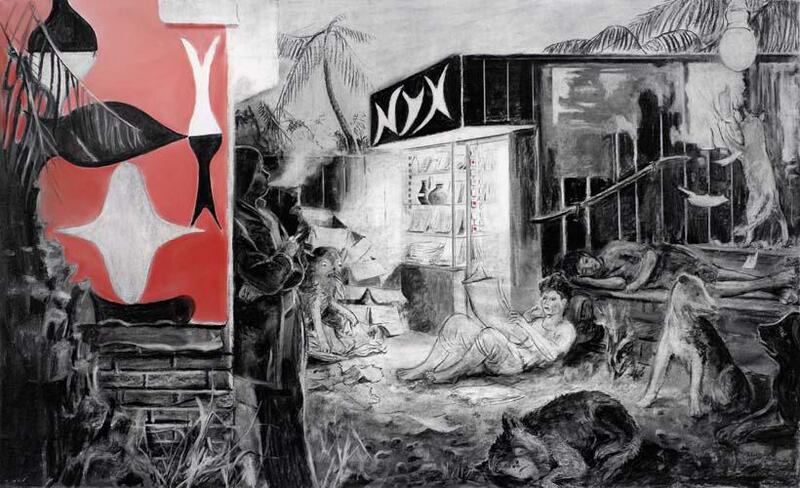 Works like these recall that of Nigel Cooke, riffing off his ability to disperse focus across the picture plane: multiple scenes exist within the same composition, vying for attention. 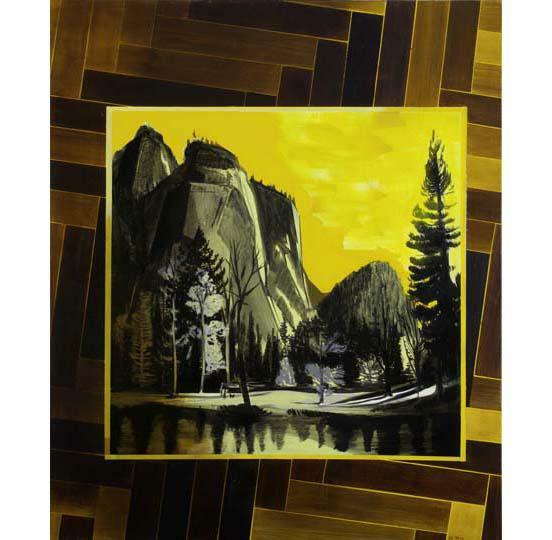 Based in Freiburg (but taught too in Leipzig like Baumgärtel), Susanne Kühn’s work mixes alpine scenery with interiors that directly reference the rigid perspectives of Northern Renaissance painters like Jan van Eyck and Jan Vermeer. 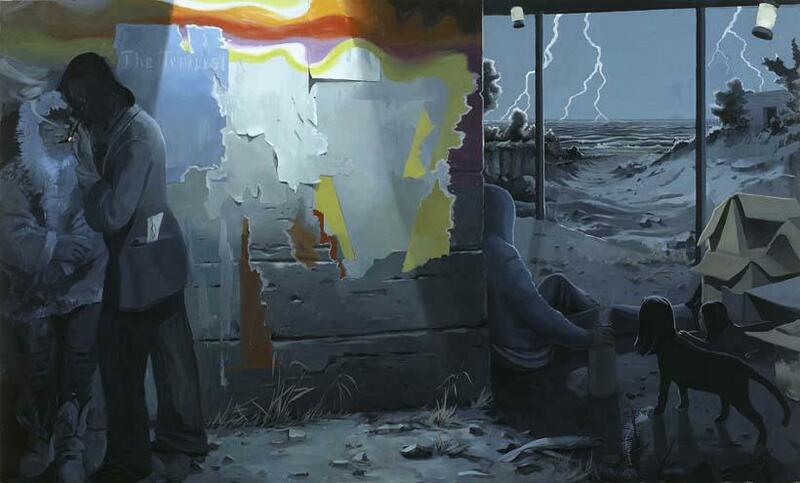 In Kühn’s canvases, contemporary figures (generally youths with gloomy faces and dressed in street wear) stand in the foreground, enveloped by twisting and breaking geometries. 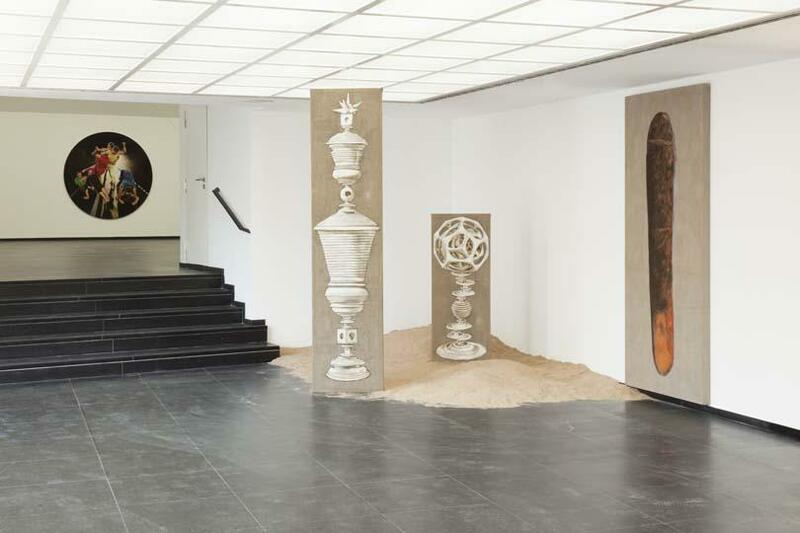 Kühn seems particularly taken with van Eyck’s ‘The Arnolfini Portrait’ (1434): a copy hangs in the background of ‘Die Arnolfinis (Green - The Arnolfinis)’ (2011) and a replica of its iconic interior dominates the right side of ‘Besuch (Visit)’ (2012). 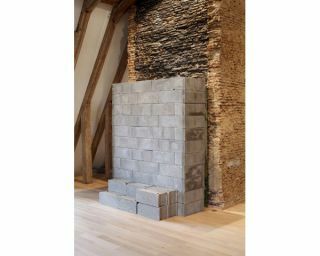 In the centre of the gallery space is another of Kühn’s works - a free-standing, modular construction that seems at once influenced by a Scandinavian design aesthetic and an altar piece (like those made famous by Rogier van der Weyden). This work, ‘Modul’ (made in collaboration with the Belgium architect Inessa Hansch) (2012) includes two painted panels within, functioning as a contemporary rethink of the outmoded religious relic - reborn as a lifestyle device. 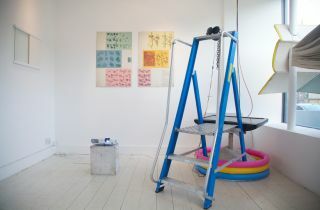 Antje Majewski, a Berlin-based artist, fills the last two spaces and is the only artist of the four also to have exhibited in the Frankfurter Kuntsverein’s previous painting exhibition in 2003. Here, in 2012, Majewski shows two quite different series. In the first space, slender, propped canvases stand just taller than human height. Ancient trophies carved from clay or bone drift in front of lazuli blue backgrounds. On the right wall hangs a Neolithic Venus figure or proto-human form. The thin, vertical and free-standing canvases push the works into a more sculptural role, toy with figurative qualities thanks to their scale, and intrigue through their incongruity. 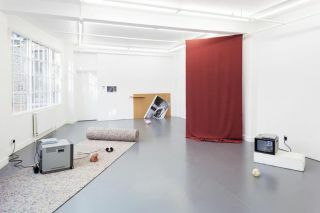 The next space, ‘Tans RGBCMYK’ (2009) is composed of multiple canvases, sculptural pieces on the floor, and a loose web of colourful extension cords that arc across the room. 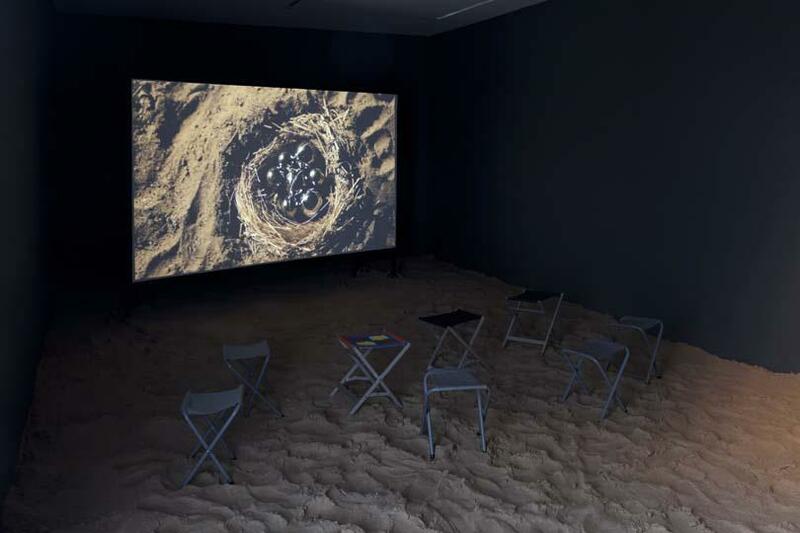 In the corner stands a small screening room for a video work, ‘The Nest’ (2012), the floor of the structure filled with coarse sand. In ‘The Nest’ we see a lone figure as they move from their studio, out into the night. In their hand they hold a spotlight, connected to the studio by a long line of power cords. The spotlight drifts across different scenes - shadows fall within bins, light and dark curdle in dank alleyways and the pitch black is pierced by bright flashes. This is the symbol of the artist as explorer, determined to bring up new forms that pry away from familiar ground. 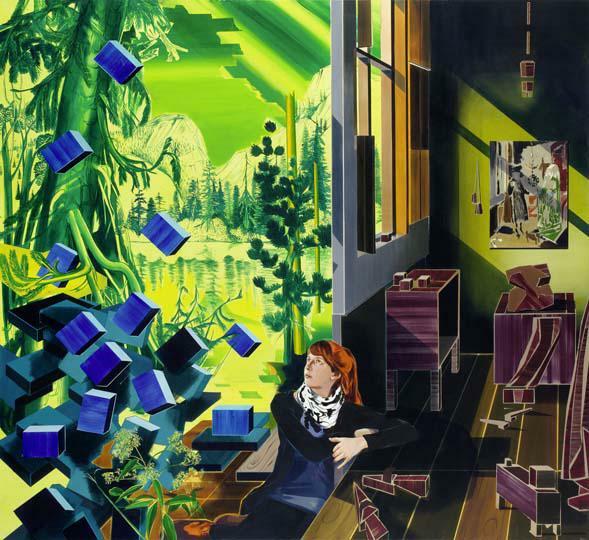 ‘Painting of Uncertain Places’ sets out to argue for figurative painting’s ongoing validity and capacity to do things abstraction can’t, such as functioning ‘as a space for rumination’as bearers of broader ideas.’ However, in actuality the show seems more determined to present four separate surveys rather than grappling with its own central premise. Ultimately, the curator seems to justify the works’ presumed absence of meaning as creating a vessel for self-projection, allowing them to be ‘negotiable or indefinite.’ By these terms, each artist, through their technical proficiency, succeeds at creating beguiling and engaging worlds.